AND the most important one is my Birthday on 22 March! By the time you get to read this newsletter, I will be five years old. Lindy and I have now been teamed up for 3.33 years. Thank you to all the wonderful people who have donated to our challenge. As little as $25 will help restore sight for someone who is needlessly blind. 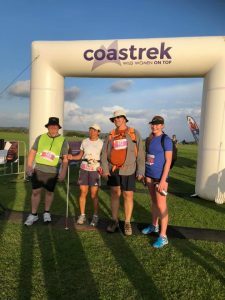 It certainly was a challenge, especially the last four kilometres when the team had to guide Lindy through the roughest part of the course over many, many rock steps to the finish line. I saw the weather forecast which predicted thunderstorms through the day and opted to stay in warm, dry Canberra. I am glad that I sent my deputy ‘Little Comet’ for this Challenge. Lindy will shortly post a video on her website showing how rough the trail was, and that was just the last few steps! 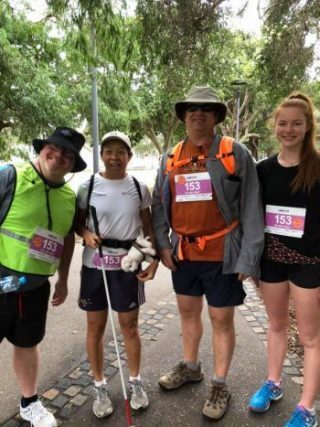 Lindy and her family members Georgia, Jamie and Stephen completed the Sydney 30km Coastrek on Friday to raise funds for the Fred Hollows Foundation. I got a seat on Lindy’s water belt. I was so excited and did lots of summersaults during the walk. I spent much of my time upside down, especially during the roughest part of the walk, just to be sure that Lindy did not step off and slide down the cliff! Luckily Lindy was able to use Stephen’s elbow and a solid cane for support. Jamie probably had the most nerve-racking job walking behind ready to grab Lindy if she slipped. So here is the recount of the day. I along with the Quad set off at 9:15am from Rushcutters Bay. Our support team of Wes, Amanda, Debbie and Oliver took lots of photos as we set off with other 30km teams. The first kilometre took 20 minutes due to the slow moving crowd and about 100 traffic lights – ok, maybe around 10 sets but they were all red when we got there! At that rate we would reach the finish at 7:15pm without any food or comfort stops! Then we weaved our way through Potts Point and Woolloomooloo via lots of stairs to the Sydney Botanical Gardens. Lindy realised that we were going around the Opera House when we caught a gush of wind. Blind people do experience scenery a little different from the sighted ones. We then slip slide around Circular Quay – that is, slip left and slide right to avoid the people who were catching the ferries. We carried on up through historic Sydney Rocks to the Harbour Bridge. The Quad, with me getting a free ride, jogged across the Harbour Bridge. This was the first opportunity for us to make up lost time before the tricky part of the course. 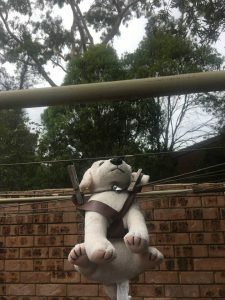 As we powered through the residential areas around Milson Point Lindy had her first incident when she got stabbed with her cane after it got caught in the concrete path! After she regained her breath, they continued on. At about 10km we reached Cremorne Point where coffee and refreshments supplied by the support crew were much appreciated. Although there were supposed to be 60 toilet stops along the route, we still had to line up! Some 25 minutes later we got going again. We were then into bush track territory through Mosman around the back of Taronga Zoo and on to Bradley’s Head for our lunch stop. While eating a resident kookaburra took a liking to Georgia’s wrap and caused a bit of commotion. A defensive line was then formed to protect the rest of our lunch. More bush trails took us to Clifton Gardens Reserve, the official ‘luv stop’. After a brief comfort stop, some lollies and drink we were on our way again. With 18km down and 12km to go, it is all down hill from here. Most people would be excited about going down hill, but not for Lindy! You can’t really fall up hill very far, but imagine falling down hill when you can’t see! Whenever the trail became tricky, Lindy had to slow right down as every step had to be described by the guide, Lindy would listen to the instruction and translate into action. For example: “One and a half metres, two steps down; one metre three steps up; two metres four steps down – Oh! A drain at the bottom of the step. I am stopping on the edge of the drain. Big step over. Ok for a bit…” Add to this rock steps with different heights and widths, and with mud puddles as well! So we took every opportunity to jog on footpaths to make up time and then took our time on the bush steps. We often caused a traffic jam with lots of Coastrekkers stuck behind us. We moved over every so often to let people through. At one stage one of the trekkers commented that that was the third time he passed us. All the trekkers were very supportive and didn’t mind being held up along the track. Many called out encouraging words as they passed. Lindy quite often replied by saying, ‘Thanks but please don’t shut your eyes while you walk.’ I guess after watching Lindy and her team negotiate the track quite a few trekkers had some appreciation of what it is being blind. We climbed up to Middle Head to take in the view from Georges Heights Lookout. It was breathtaking, and I told Lindy so. We were able to jog for quite a bit along the top of Middle Head past the military base. We then went through more bushland and a series of stairs to drop down to Balmoral Beach. This was the finish line for the 55km Trek back in 2015. From here on it was new territory for Lindy and her team. First an easy stretch along Balmoral Beach and then up the bush track again, over some steep roads and then a long stretch all the way back down to The Spit Bridge. The support crew found a nice café where we all had a cool drink and a comfort stop. 5km to go! It was nice walking over the Spit Bridge, then back on to bush tracks. The last 4km were probably the hardest part of the whole Trek! Apart from a much narrower track, more muddy patches and a lot more steep and slippery steps, we were all pretty tired, especially in Lindy’s head! It took longer for Lindy to interpret the instruction and follow with action. With 2km to go the trekkers were greeted by volunteers with frozen juice triangles. Everyone enjoyed them; I didn’t mind having some on my labrador coat! When we finally got up the last few steps it was a relief for everyone. The volunteers directed the group to go across the street, up a few ‘normal’ steps and then through the finishing banner. Well! No more going down steps! Although it was challenging, it was also a wonderful feeling when we finally got to the finish. We came in a bit after 6pm and completed the trek in under nine hours. A special thanks to our support crew as we couldn’t have done this without their support along the route. The fourth annual World Rowing Virtual Indoor Sprints took place from 6-10 March 2019. This is an event which allows rowers from across the world to record their fastest times over one kilometre during those five days. This year, 6059 competitors from 73 countries took part. 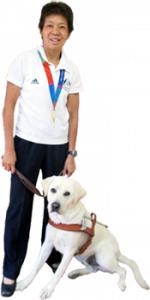 Lindy got 3rd place in the 50+ Para Vision Impaired category. I just watched on and cheered with Fiona, while Kerry coached Lindy through the distance. On the Coastrek this became: “Stepping Stones are just Challenges to Success”.